By now, most everyone involved in HCM technology has been involved in some kind of discussion about “digital transformation” and “digital business,” not to mention the pressure from employees to have access to simpler, consumer-like self-service tools. 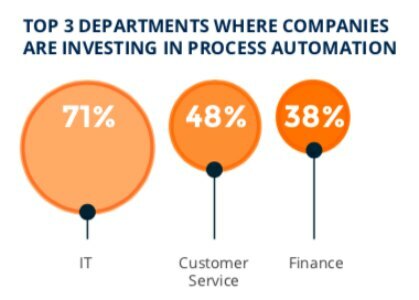 However, according to the process-automation company Nintex, HR isn’t even among the top three areas of focus for companies actively seeking to intelligently automate or otherwise increase their digital footprint. To compile its 2018 report, Bellevue, Wash.-based Nintex conducted two surveys, one of 450 U.S. decision-makers directly involved in their organizations’ digital transformation strategies, the second of 650 line employees. It found most companies lag in their efforts to transform themselves into digital businesses because, in large part, they’re hindered by a disconnect between IT’s focus on code and business functions’ demand for pre-packaged apps. Nintex found “an over-reliance on full-code/low-code solutions and [factors that] point to the need for no code tools that enable line of business users to rapidly design, build and automate their own workflows.” Most HR leader we’ve spoken to tend to think along similar lines: They want their IT departments to vet their workforce solutions, not select or build them. That’s not necessarily a bad thing for IT. Bottlenecks there, possibly caused by overreliance, also hamper the digitization process, as do budget shortfalls and a shortage of in-house talent. Communications is also an issue: Nintex said plans for digital transformation often neglect efforts to effectively get the word out to line employees. Nintex lays the bulk of responsibility for these struggles on a lack of communication with the lower ranks. Just 47 percent of line employees are aware of what digital transformation is, or even if their company has a plan for it. Of non-IT workers, only 27 percent know about digital transformation, and so are more likely to worry their jobs are endangered by automation when they’re actually not. “Poor top-down communication is leaving line of business employees in the dark about digital transformation efforts within their companies,” the report said. Complicating the picture is simple demographics: More than half, 54 percent, of decision-makers age 54 and up are skeptical about business staff adopting new tools. Since older executives still hold most leadership roles, their old habits and conservative mindset often hold their organizations back. Only 23 percent believe digital transformation efforts have been extremely successful, compared to 42 percent of Gen X and Gen Y decision-makers. And just 26 percent of Baby Boomers list customer experience as a top priority for new technology investments, compared to more than half of younger leaders.